(CNN) -- Italian Franco Pellizotti claimed the third Giro d'Italia stage victory of his career after winning the epic climb up to Blockhaus, in the earthquake-hit Abruzzo region, on Wednesday. Pellizotti was delighted to claim stage victory on the feared Blockhaus climb. 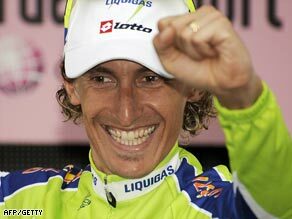 The Liquigas rider, who finished fourth overall in last year's Giro, attacked at the bottom of the ascent and held off his rivals to move up to third place in the overall classification. Race leader Denis Menchov of Russia stuck to the wheel of nearest challenger Dano Di Luca, losing just fives secoknds on the line. But Di Luca also picked up an eight second time bonus for finishing third on the stage and has cut Menchov' s lead to just a 26 seconds with four stages remaining. They include the ascent of Mount Vesuvius on Friday and the final time-trial in Rome on Sunday, leaving Di Luca with ample opportunities to wrest the pink jersey from Menchov. Pellizotti, who has been vying with Ivan Basso for leadership of the Liquigas team throughout the race, completed the stage in two hours, 21 minutes and six seconds, ahead of compatriot Stefano Garzelli, who pipped Di Luca to the 12 bonus seconds on offer for finishing runner-up. Di Luca, the 2007 champion, collected eight bonus seconds for coming home third and now trails Rabobank rider Menchov by just 26 seconds overall, with Pellizotti exactly two minutes behind in third position. The 83km 17th stage started from the town of Chieti and gradually worked its way up to Blockhaus, the first time the Giro had been up the giant ascent for 25 years. The stage, which was strategically-placed immediately after the rest day, promised fireworks -- and so it proved. An early break stayed away until the foot of the climb, but Pelizotti's attack ruptured the peloton, with American Levi Leipheimer and 16th stage winner Carlos Sastre both getting distanced. Sastre eventually recovered to finish in a group that came over the line behind fourth-placed Menchov, but Leipheimer finished off the pace as any hopes he had of overall victory vanished. However, Leipheimer's Astana team-mate Lance Armstrong again showed signs of coming back to form, with another strong ride. The seven-time Tour de France winner broke away in an attempt to catch Pellizotti but was eventually caught by the relentless Di Luca. However, Armstrong held on to come home in Sastre's group and looks to be peaking just in time for his assault on an eighth Tour victory.